Tianlongshan Grottoes, a good example of China’s Buddhist cave art in Taiyuan city, reopened to public last week after 2.5 years of restoration. The grottoes were threatened by falling rocks and rain erosion before the restoration. According to the site's administrative office, rocks surrounding the grottoes have been reinforced and cracks have been filled with cement. Workers also dug gutters on the top of caves to protect them from rain erosion. Meanwhile, walkways and guard rails have been rebuilt to protect tourists. The restoration project, with a total investment of more than 10 million yuan ($1.5 million), started from November 2014 and was completed in June this year. 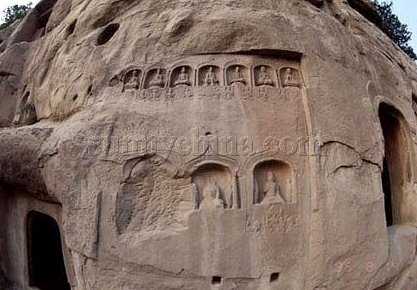 Construction of the Tianlongshan Grottoes started in China's Northern Wei Dynasty (534-550). The site highlights a number of works of Buddhist sculpture survived in the caves, including over 1,500 Buddhist statues and 1,144 reliefs sculptures.